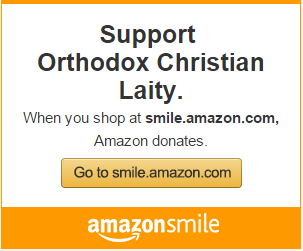 [SYOSSET, NY – OCA] On Friday, October 21, 2011, Archpriest Eric G. Tosi, Secretary of the Orthodox Church in America, announced that Archpriest John A. Jillions has accepted the position of Chancellor. Selected from a slate of several applicants, Father John was confirmed by the Holy Synod of Bishops upon the recommendation of the Metropolitan Council at their fall sessions. A life-long member of the Orthodox Church in America, Father John was born in Montreal, Quebec, Canada in 1955. He holds a Bachelor of Arts degree in Economics from McGill University. In 1980, he received the Master of Divinity degree from Saint Vladimir’s Seminary, Crestwood, NY, from which he also received the Doctor of Ministry degree in 2005. His doctoral thesis, The Language of Enemies, traces the ways Orthodox Christians perceive and treat their enemies and uses some of the insights of contemporary conflict studies. In 2002, he was awarded the Ph.D. in New Testament from Aristotle University of Thessaloniki. His doctoral dissertation offered a comparative study of the ways divine guidance was understood in the first century Pauline, Greco-Roman, and Jewish worlds. After his ordination to the diaconate and the priesthood in 1981 and 1984 respectively by His Eminence, the late Archbishop Peter [Huillier], he served Holy Virgin Protection Cathedral, New York, NY; Annunciation Church, Brisbane, Australia; Holy Trinity Church, Rahway, NJ; Saint George Church, Thessaloniki, Greece; and Saint Ephraim the Syrian Church, Cambridge, UK, before returning to Canada in 2003. 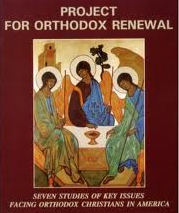 He was a founding director of the Institute for Orthodox Christian Studies in Cambridge and served as its first Principal from 1999 until 2002. Previously, he served as administrator of Saints Cosmas and Damian Adult Home, Staten Island, NY, and as a bank officer with Bankers Trust. In the early 1990s, he served briefly as a Chaplain (Captain) in the US Air Force Reserve. 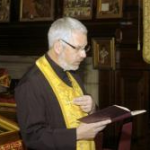 Since 2003, Father John served as an Associate Professor with the Sheptytsky Institute of Eastern Christian Studies at Saint Paul University, Ottawa, where he taught in the areas of 20th century Orthodox Christian thought, New Testament, ecumenism, and practical theology. 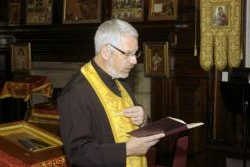 Concurrently, he served as Dean of Ottawa’s Annunciation Cathedral until 2009, at which time he was attached to the cathedral while serving on loan to the Greek Orthodox Metropolis of Toronto, servicing a small community in Brockville, Ontario. He also has been a contributor to the Ask the Religion Experts column of The Ottawa Citizen and most recently has served as one of the vice-presidents of the Canadian Council of Churches. He and his wife, Denise Melligon, have three grown sons, Andrew (married to Alice), Alex (married to Meaghan), and Anthony. Father John’s introductory letter to the Search Committee, which outlines his priorities, may be read here.